One of the fun things about being a food blogger is getting to try new products and equipment. A few weeks ago MyBlogSpark sent me this cool baking kit which includes a rolling pin, a pastry brush, a small rubber spatula (I happen to LOVE spatulas!) 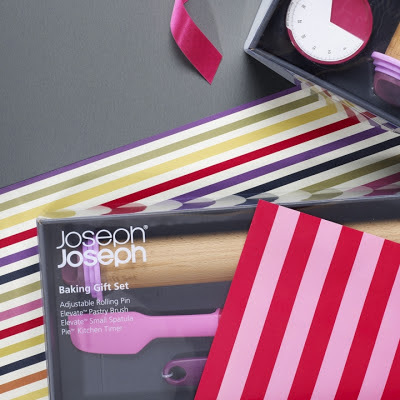 and a super cute kitchen timer in this JosephJoseph baking gift set. To be quite honest I haven't had the time YET to try out these nifty tools, but I can tell you they are super cute! But instead of making cookies (I'm lazy, what can I say?) I decided to use the 8x8 pan and make a batch of chocolate chip cookie brownies! TO make the brownies all I did was add the required 1 stick of butter, but instead of one egg I used two, and then added 1 teaspoon vanilla, and 1/4 cup of milk. This made the brownies more cake-like, but Michael loved them. I baked the batter in the pan for about 25 minutes at 350 degrees. That's it. Super easy, super quick. While I'm not a huge fan of gluten-free prepared baking mixes... it is fun to have these on hand for last minute chocolate chip cookie emergencies. Michael really enjoyed the mix and said he liked the brownies as much as he would have actual cookies... so win win! But my favorite thing about companies like "MyBlogSpark" and Betty Crocker? They not only send me goodies to try, they offer bloggers an additional set to giveaway as well! SO Here's your chance! Want to win your own set of baking supplies? Congrats to Shannon F. for winning the baking set! 1 prize pack of a JosephJoseph Gift Baking Set + a brand new 8x8" baking pan will be provided from General Mills and MyBlogSpark. Enter by leaving a comment below on this post AND please include a way for me to contact you -- your email address preferably. The giveaway begins June 24, 2013 and ends on June 29, 2013 at 11:00 pm eastern daylight savings time. No purchase is necessary. Odds of winning are based on the number of entries. The winners will be randomly chosen and will be contacted by email. The winners will have 24 hours to respond. If the winner does not respond, a new winner will be randomly chosen. I was given a free gift baking set and an 8x8" baking dish from MyBlogSpark and General Mills. This is not a sponsored post and I did not receive monetary compensation. The opinions in this post are completely my own. The giveaway prize pack and baking pan have been provided by MyBlogSpark and General Mills. I would love to win this. I have given a lot of my baking supplies to my kids when they moved in to their own places. I love how baking set has pink accents :) So cute! I love Joseph Joseph products, they're so colourful. I love to bake but don't actually own a rolling pin so winning this set would be awesome! At the moment I use a wine bottle to roll things out.. I too love spatulas, they're just so versatile and come in so many pretty colours! I really like the Betty Crocker pre mix. It is my go to for quick baking. my email is Valerieldeleon@gmail.com I would love to win. So awesome! Would love to try the new mixes! I would love to win. I would also love to try those mixes. I try to stay awake from prepared mixes as well but I love to have some in the cabinets for a quick fix! I would love to win, This would be great as I am not very good with the gluten free baking! That is a beautiful baking set, I would love to win. Thank you for offering this opportunity to win baking supplies. You are right - the set is super cute! It is always good to have a mix on hand for those chocolate emergencies! I would love to win this! My husband just found out about 6 months ago that he cannot eat wheat gluten any longer! It's a challenge to cook certain foods now, but overall I'm enjoying the switch! Thanks for the opportunity to win this! This set is adorable! I would love a new baking set. I have also tried the new baking mixes and they are pretty good! My friends and family really love the chocolate chip cookie mix! Thanks for the chance to win! this sounds interesting. I love spatulas too. Always love you blogs and giveaways. You also make everything look so easy. I have never heard of Joseph Joseph ( But since I started on my Celiac Journey I have learned of a lot of things that I have never heard of before!) I love keeping Betty Crocker gluten free products on hand for quick fixes too! 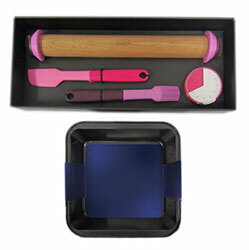 I have been looking for a perfect rolling pin and baking set such as this! This would be such a dream to win! Thank you! i need an 8x8 pan so bad! what a fun giveaway! Looks like a great giveaway. Throw my name in the hat - vera khule at gmail dot com. What a nice set! 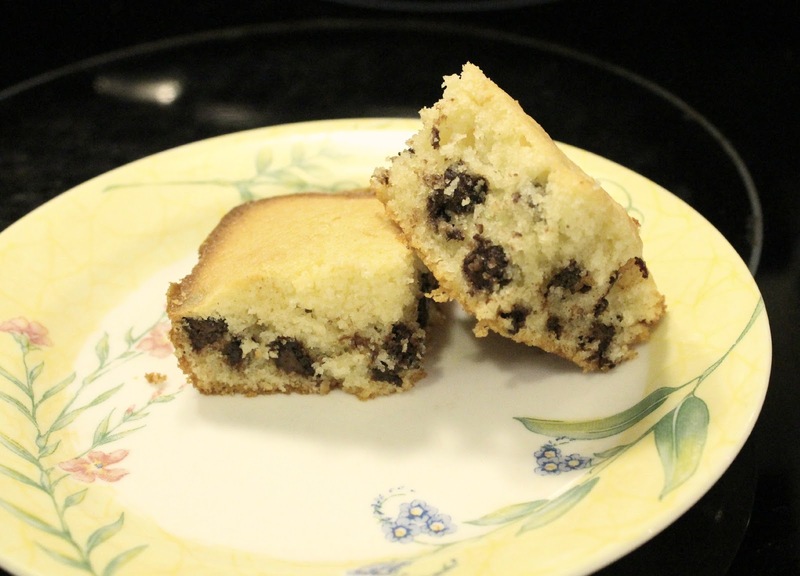 I became gluten-free just recently and still am exploring the world of g-free baking (and learning!). Would love to win some new kitchen tools to help me learn how to bake (I just used to eat everything store-bought and since it's cheaper to make my own gluten-free food, I am studying every single cookbook now :). Oo, I hadn't heard of Joseph Joseph before this, but their kitchen tools are so cute! Can't go wrong with stainless steel & silicone. These look great!! It would be amazing to win them! I've lived in Australia the past 2 years... It has been SO exciting for me coming back home and trying all the brilliant gluten free products that weren't here 2 years ago! Those mixes look yummy, I always try to cook from scratch BUT if you want something quick, the mixes are great! Awesome giveaway!! Those mixes would be great for a weeknight treat! Ooohhh... lovely set. You can contact me at amywing at cox dot net. Thanks for the chance to win! This is awesome and I would love to win it! I'm always looking for new ideas, items, etc. when it comes to preparing new things. My 10 yr. old and I have celiac disease and I have severe food allergies. I have about 10 foods that I can eat and it is very challenging. Thank you so much for offering this!